With Sarah Rothberg. Music by Yotam Mann. The Physical Equalizer is a midi volume fader made from 6 soft sensors and 20 wooden cubes. 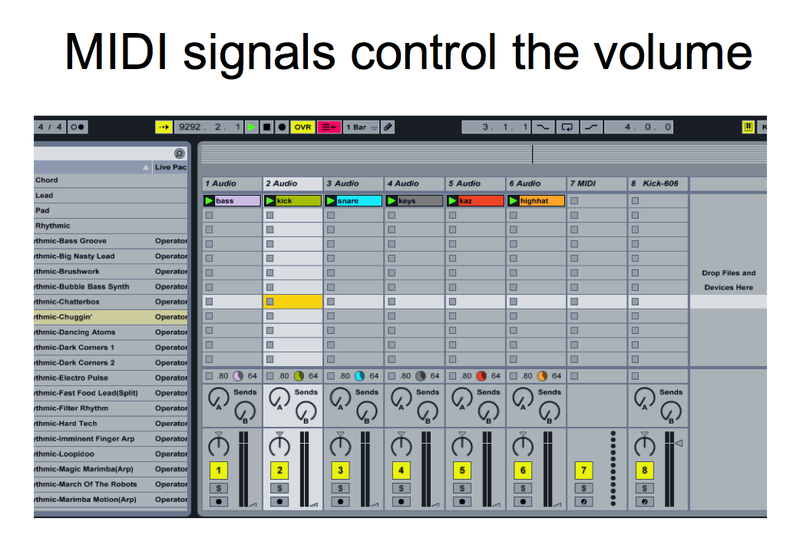 In this application, each sensor is linked to a track on Ableton Live through MAX/MSP. Placing a cube of wood on the base of the controller activates a corresponding track. The cubes are stackable, and the more cubes there are on a sensor, the louder the volume of that track. This device can be played as a music instrument, as a live performance tool, a mixing device for engineers. It can be experienced through speakers for a public performance or headphones for a individual experience. a minimum of 20 blocks (material of which to be confirmed after sensors sensitivity tests. 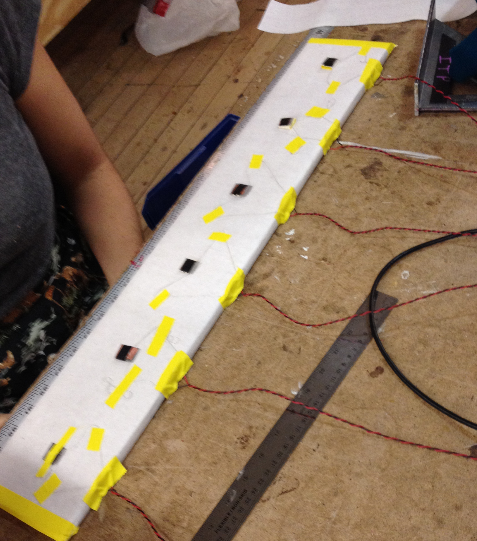 The blocks will be disposed on a playing surface where some specific spots – one for each sensor – will be defined. It will be obvious you have to play with the blocks and stack them on top of each other on one of those specific spots. 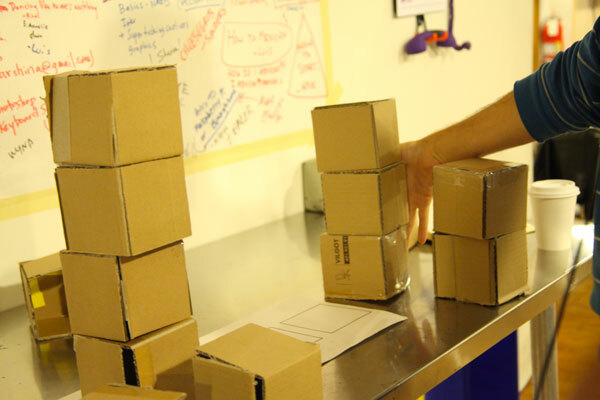 The sensors will feel how heavy the stack of block will be and activate music accordingly. We will be working with weight sensors and map their readings to create a variation in the sound when the user put a block on top of each other. We are still in the process of defining with which sensors we will work. We tried the flex sensitive resistors but they are too sensitive and their readings are really fickle. 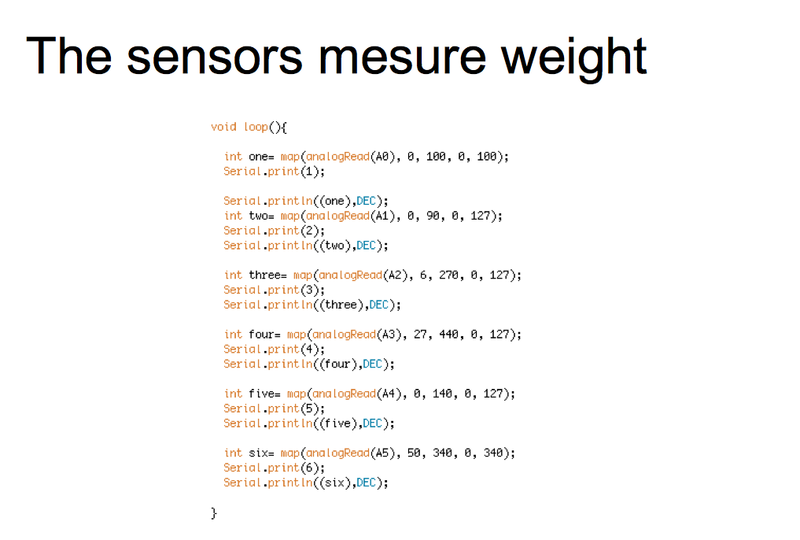 We found a load sensor that can weight until 40-50 kilograms. They seem pretty contants. But we do not know if their readings will be accurate will lower weight. We will test them this week. We settled on creating soft sensors using conductive fabric and resistive foam. 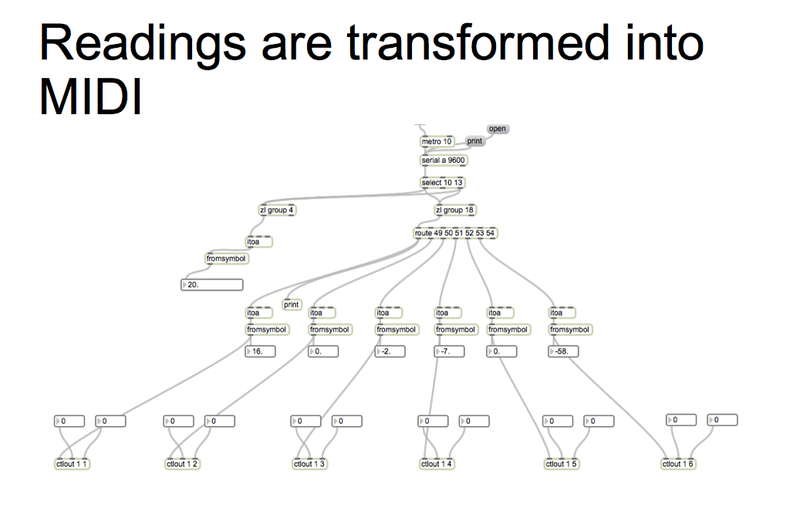 which was plugged to an online sequencer to fake the music interaction. 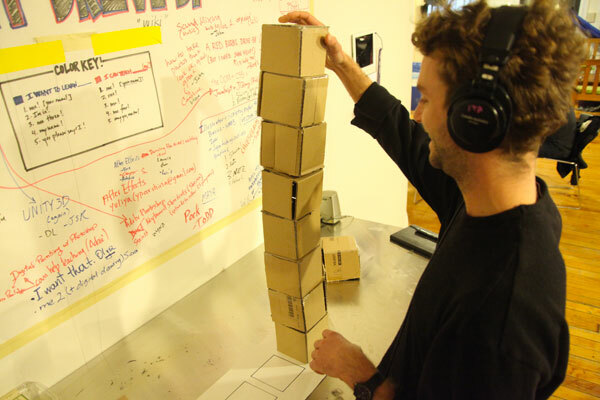 Every time a user would pile a cube, we would fake the equalizer effect in real time using that online sequencer. 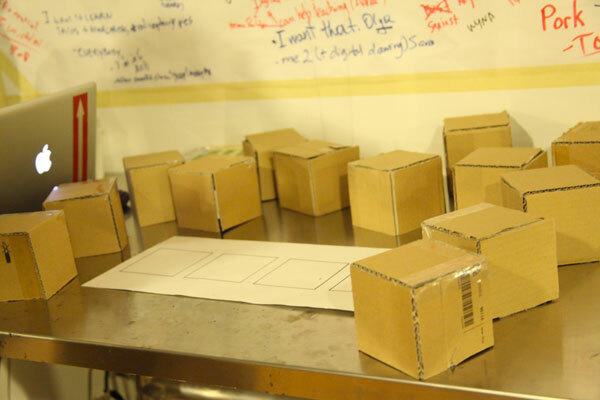 The size of the device was arbitrary and depended on the cardboard available. We wanted to have enough blocks to inspire the users and see what they would do with them. Eight users tried the device. Watching people interacting with the device made us realized we have to ask ourselves: what is the purpose of the device? is it a functional device? Is its purpose to be an functional equalizer people would use mainly to manage and equalize the music they listen too? is it a game people can play with? With instructions and a rewarding system? or is it an instrument and/or a performing tool musicians/djs would use? We have to think about it to make sure the way it is programmed is fluid and its working is clear. 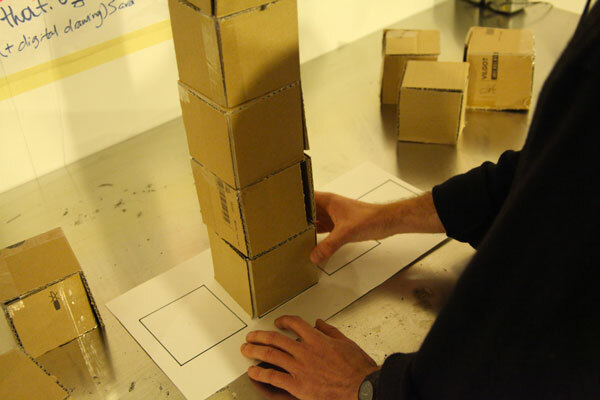 The way the play test was organized made it easy to transform it into a game and an instrument device. The tracks we used were made of multiple sounds and it was hard to clearly understand it could act as a real equalizer. All the users liked the idea of composing and constructing their own music piece using the blocks. The performance aspect was also really interesting. The blocks were displayed around four squares drawn on a piece of paper. When the user was in front of it ready to start, we only said: go! We did not give any instructions. It was also nice to see that the users did not need any trime frame. Some of them played for 2 minutes, others 5 minutes. It really depended on their willingness to try various tricks with the cubes stacking and movements. Over all, the play test showed us our device can offer a clear visual framework preventing us having to write instructions or orienting the users. The functionalities are pretty simple to understand, and when they get them, the device is really fun. Two of the users did not understand the cubes add an impact on the sound. The persons focused on the shape that could be build and did not pay attention to the sound scheme. They thought it was an accompanying music. This might be due to the online equalizer we used. Every tracks had basses and highs and it was not easy to identify which tracks was linked to which pile of cubes. Because we were operating by hand, the sound changes were not always in sync with the user movements. Anyhow, we will have to make sure the music changes will be immediate and clearly responsive to the cubes movements. The play test made showed us the cubes weight and material are gonna be crucial in the definition of the device interactivity. if we go for heavy blocks, the users will be more into slow moves and might move them separately. all the users wanted to use all the blocks. This means we will have to come up with an appropriate number of blocks, not too many, not too few. This will depend on the sensor’s sensitivity. piled them into a pyramid. Every user did something the precedent did not do. It was really nice to see there are so many ways to use the same device. We created 6 soft sensors connected to an Arduino. Interactivity is a mix of gestures and interfaces. We wanted to create a device that puts the emphasis on the gesture, not on the technology. How can we put the user into a special and unique creative mode? 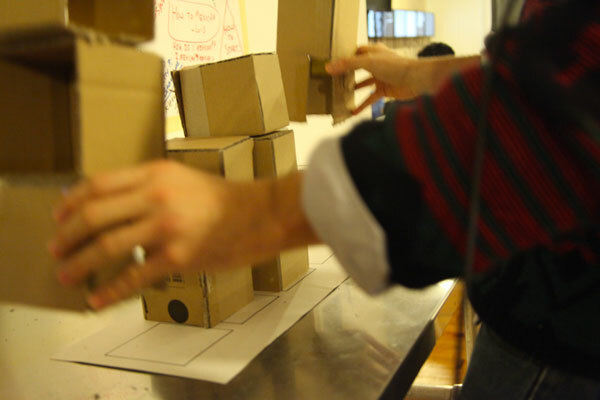 How can we build a tool that invites the user to be spontaneous and engaged? We aimed to create a simple, recognizable interface using materials that encourage child-like play. Our main research was on soft fabric sensors. We discovered and learned how to make them and which fabric is best for the device. 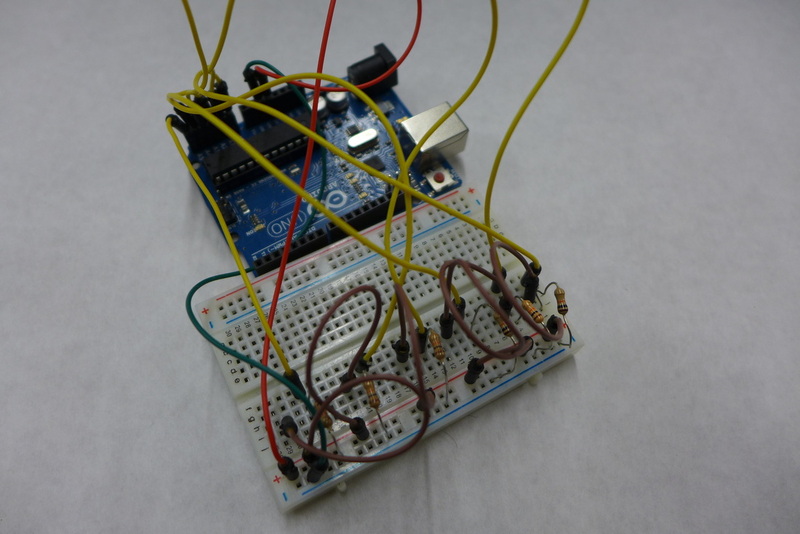 We have built our own sensors and created a template that can be shared. The target audience is diverse. Any adult or child can play or perform. Musicians can use it as a performance tool, as it acts as a visualization of what is happening on a computer. Sound engineers can use it as a mixing device. 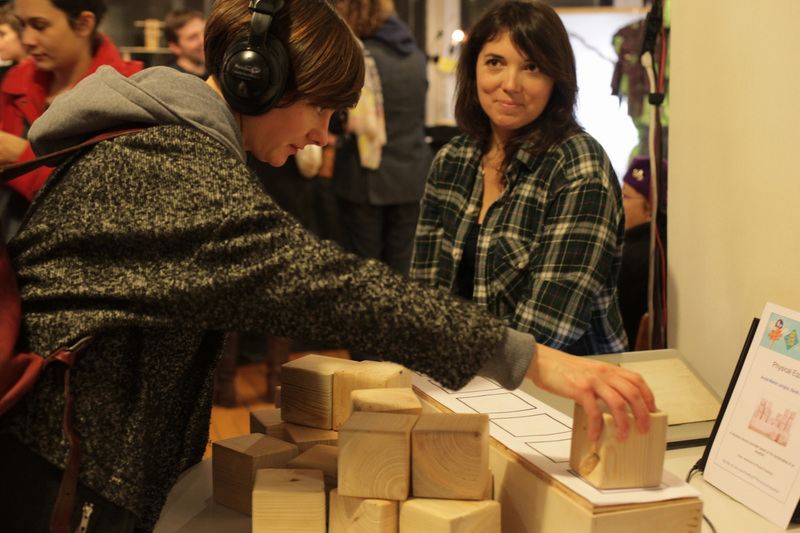 The user is invited to play with wooden cubes to manipulate the volume of a track, or turn that track on and off, using it as a musical instrument. 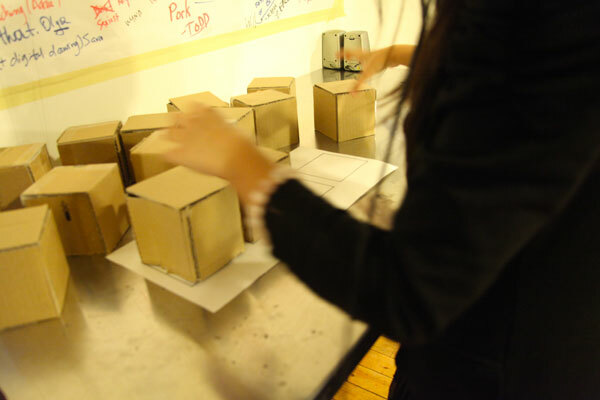 Using the cubes to increase or decrease the volume of a specific track allows the user to visualize the music. The cubes are made of wood and are reminiscent of toy construction blocks, encouraging users to build and play. to put the user into a playing mode. The wooden interface puts the emphasis on the gestures of the user, not on the technology. The physical equalizer is made of a rectangular platform with 6 soft fabric flex sensors and 20 wooden cubes. Each sensor is linked to a music track on Ableton Live. 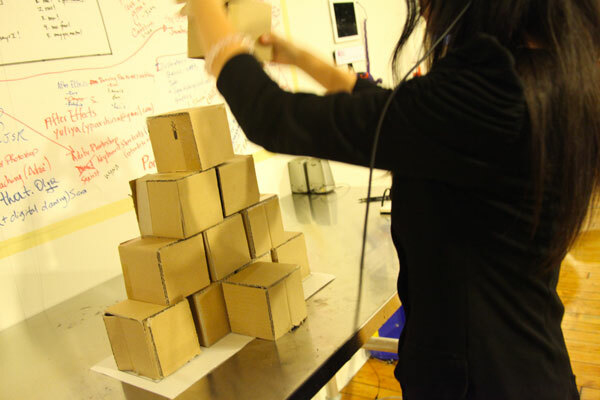 The user stacks the cubes on the sensors to activate the music tracks. The more cubes there are on a sensor, the louder the volume of the track. We learned how to conceptualize and build a simple user interface that can have multiple uses and purposes. Making simple and clear interfaces is a complex task. We think we succeeded creating a full and entertaining interactive experience with the physical equalizer.